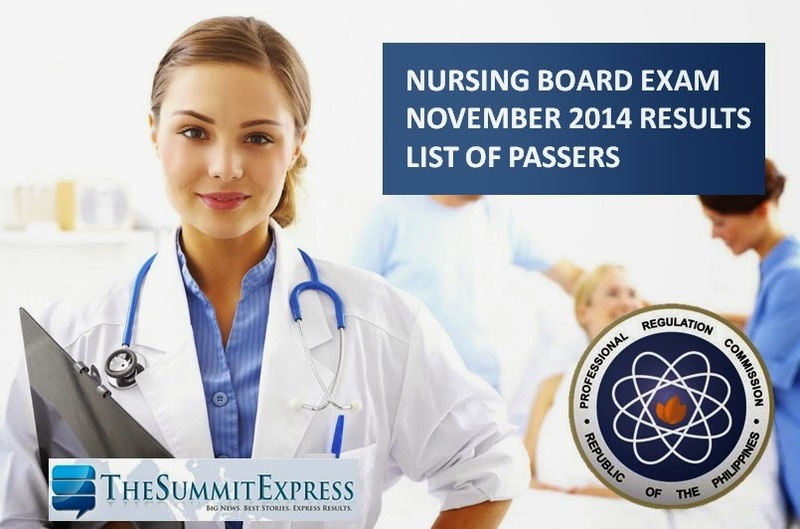 Those awaiting results of November 29-30, 2014 nursing board exam known as nurse licensure examination (NLE) may find here the complete list of passers, top 10 (topnotchers), top performing schools and performance of schools as the Professional Regulation Commission (PRC) and Board of Nursing (BoN) released complete results in 29 working days after the last day of exam. PRC on Friday announced that 15,292 out of 26,690 (57.29%) passed the Nurse Licensure Examination. The agency said that the results of examination with respect to five (5) examinees were withheld pending final determination of their liabilities under the rules and regulations governing licensure examination. The members of the Board of Nursing who gave board exam are Carmencita M. Abaquin, Chairman; Perla G. Po, Gloria B. Arcos, Carmelita C. Divinagracia, Carfredda P. Dumlao, Glenda S. Arquiza and Florence C. Cawaon, Members. The November 2014 NLE consists of five (5) parts namely: Nursing Practice I (Basic Foundation of Nursing and Professional Nursing Practice), Nursing Practice II (Community Health Nursing and Care of the Mother and Child), Nursing Practice III (Care of Clients with Physiologic and Psychological Alternations - Part A), Nursing Practice IV (Care of Clients with Physiologic and Psychological Alternations - Part B) and Nursing Practice V (Care of Clients with Physiologic and Psychological Alternations - Part C). In May 2014 NLE, PRC named West Visayas State University- La Paz, Cebu Normal University and Silliman University as the top performing schools per Commission Resolution No. 2010-547 series of 2010. According to PRC, the target date of release of NLE results is on Saturday, January 31, 2015. The big day falls on 62 calendar days or in 38 working days after the last day of exam. The computed number of working days excludes Saturdays, Sundays and 7 holidays in December 2014 and January 2015. Since it's not usual that PRC release results of nursing on Saturday, examinees are advised to monitor results earlier than the target date or in the following month (first week of February 2015). In December 2013 exams, results were released in just 24 working days. A total of 10,977 out of 35,475 passed the Nurse Licensure Examination. TheSummitExpress expects that results are out online between January 26 to February 6, 2015. TheSummitExpress has partnered with PRCBoardNews.com to deliver updates and scoops before the official release of NLE results. We will update this page once we got reliable information from our sources. For the previous board exams, takers can expect exact release date of results by always visiting this site. It's also possible that PRC will release results on earlier date than our expected timeline if there's an improvement in the PRC system of checking of results. December 7, 2014 1st Update: PRC Baguio said that November 2014 nursing board exam (NLE) results are out after 42 working days. Full details here. December 7, 2014 2nd Update: Carl Balita hinted that results are out in January. "What follows MERRY CHRISTmas? Eh di happy new yea-RN!!! A suffix with a lifetime privilege!!!" December 15, 2014 Update: Balita said: "The dawns of the Sabbaths beyond shall just be in your hand, as He hands over the lifetime privilege of caring to those most deserving." Some speculate that results are out within the first two weeks of January 2015 or before Pope Francis arrives. January 1, 2015 Update: Balita on his latest riddle has hinted that results are out soon. "The new year has a special moRNing coming soon! Who shall be prepared with the privilege to meet the ruler of the Holy See? It is within when the laborers' digits sum up as a paired palm giving high five." January 11, 2015 Update: Balita on his second to the final riddle has hinted that results may came out within the papal visit week or on January 15-19. "The arrival of the head of the Holy See MAY delay some granting of the caring privilege as earlier expected but surely shall allow more opportunities to pray and to DOUBLE the celebration from his departure when SIMILAR day to (being the soonest) or a sunset AFTER the similar day to (being the latest) his arrival becomes the day for the arrival of the 2-letter suffix upon those privileged and blessed." January 13, 2015 Update: Reports say that November 2014 NLE results are out in few days after Pope Francis leaves the country or within January 20-23, 2015. January 20, 2015 Update: Reliable source say November 2014 nursing board exam (NLE) results are out online SOON. January 21, 2015 Update: NLE Results out VERY SOON. Congratulations to the new RNs. January 23, Update: NLE Results are OUT now! To receive regular updates on nursing exam-related content, we encourage our readers to bookmark this page or Share Now this article on social networks (Facebook and Twitter). Subscribe now to our E-Mail list.